maintaining a minimum level of civil amenities (routine policing, sanitation, provision of electricity, water, and fuel). Not essential but certainly in the interest of long-term stability are functions such as these: a plan for national and regional economic development, a plan for development of stable institutions for civil society, and a plan for transition to civilian rule. If it is possible to demonstrate that ordinary life is improving for the mass of ordinary people, the state is more likely to gain a degree of acceptance. Almost none of the positive functions of government seem to be available in Burma today. Corruption is rampant. Brutality and mistreatment of civilians by soldiers appear to be rampant as well, especially in peripheral states. (Examples of brutality by soldiers drawn from the twitter feed include beatings, rapes, forced marriages, and forced labor.) And economic prospects for typical citizens are not improving; the country’s wealth is being exploited for the benefit of military and political elites almost exclusively. So what does this suggest about Burma and its current subjection? Several things. First, the Burmese military state appears to have a very secure grasp on power; the opposition has little real leverage to force change. The ethnic armies have either come to cease-fire agreements with the regime, have been crushed (Karen National Union), or have settled into an acceptable status quo. Even the more active Kachin Independence Army poses no realistic threat to military rule. The National League for Democracy (NLD) may have widespread support in Rangoon and London; but it is hard to see how it can lead a movement that would seriously challenge the military and police system. Even mass demonstrations appear to be ineffectual in forcing change on the SLORC — this was one of the lessons of 2007. The regime has adequate access to revenue, through its control of Burma’s natural wealth. The junta’s willingness to use overwhelming brutal force against civilians is entirely credible — witness the past forty years. And internationally, only China appears to have real economic leverage with the Burmese junta — and the Chinese are doing a great deal of investment in Burma. Western sanctions have not had economic effect on the junta or the military, and it appears that ASEAN censure is harmless as well. So it’s hard to see how this is going to turn out well for the forces of democracy in the medium term. A democracy movement needs a certain amount of space in order to act effectively on a mass scale; and the junta seems to be all too capable of ensuring that this doesn’t happen. Cljo — thanks. The interview is interesting. 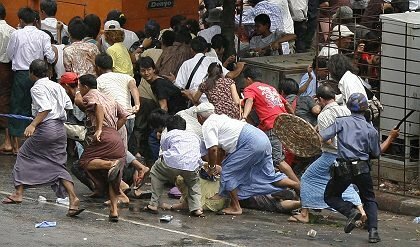 My point about Burma is that it seems to be quite a ways back from the starting line where a popular democracy movement can get started, with any probability of success. It's true, though, that the Burmese army has announced elections for next year — and is systematically repressing any possible basis of organized opposition. (This week's arrests of NLD supporters on the occasion of Martyrs Day is illustrative.) So this is a situation analogous to the situation of "non-democratic" elections that Collier talks about.